Mortgage loan Interest rates can and do change on a daily basis; some of those changes are minor, others may result in a sharp upward or downward turn. The mortgage loan rates a borrower checks in the morning may not be the same rates as those posted later in the day. 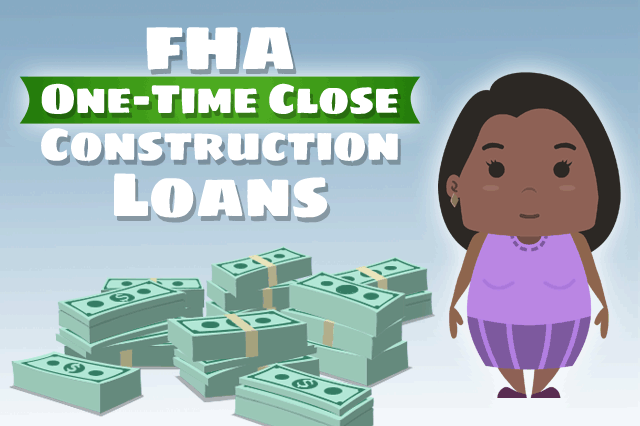 January 26, 2019 - Are you considering an FHA One-Time Close construction loan in 2019? Are you concerned about interest rates in the new year? It’s true that mortgage loan interest rates have had an interesting ride in 2018, and the new year may bring more of the same. But there is a tool borrowers and lenders use when the time is right that can help protect the borrower from future rate adjustments. But when you are fully ready to commit to an FHA mortgage loan, you and the lender will have the option to negotiate something called a mortgage rate lock-the commitment you and the lender make to a specific rate which will be held for a specific length of time. There are situations where the mortgage rate lock may be longer than what is mentioned in that quote above, greatly depending on the agreement you make with the lender. It is NOT safe to assume anything about the length or conditions of the interest rate lock agreement on your FHA One-Time Close construction mortgage. What is written in your legally binding agreement is what will apply. Mortgage rate lock periods expire and the terms of that expiration will be spelled out in your agreement. But borrowers can sometimes experience complications with the loan and the loan’s closing date-it is entirely possible in such cases that the expiration of a mortgage rate lock agreement will pass before the loan closes. Borrowers should discuss such contingencies in advance with the participating FHA loan officer to see what arrangements can be made in the event you need to extend the lock or renegotiate it. The mortgage rate lock is a powerful tool that can help borrowers as they get closer to home ownership, but the lock is something that you will need to become literate about in order to make the most informed decision possible. Ask your loan officer what the financial institution’s standard terms and conditions are regarding mortgage rate locks for construction loans in advance of the need for it if you aren’t sure how they will affect your construction loan transaction. We have done extensive research on FHA One-Time Close mortgages and spoke directly to the licensed lenders for most states. These are qualified mortgage loan officers who work for lenders that know the product well. 4. Are you or your spouse (Co-borrower) eligible veterans? 5. If either of you are eligible veteran’s, the down payment is $0 up to the maximum VA lending limit for your county. If not, the FHA down payment is 3.5% up to the maximum FHA lending limit for your county.